Bridge Engineer, State Division of Highways, Sacramento, Calif. Author F.W. 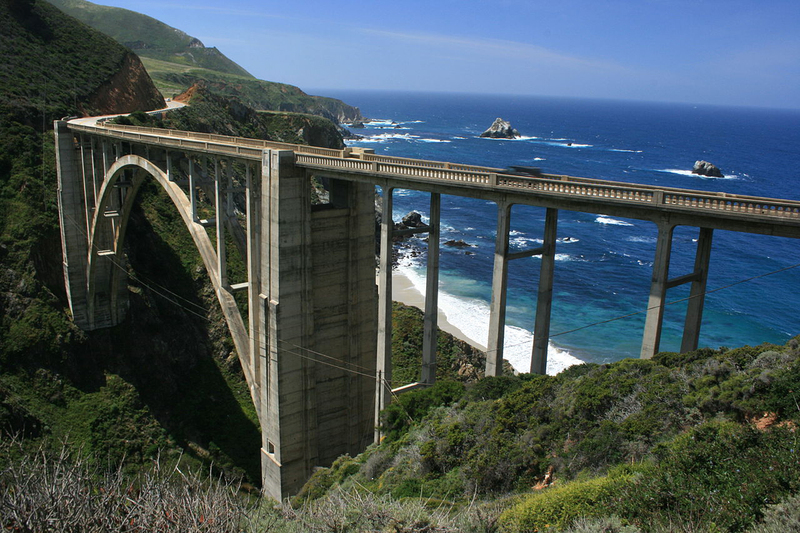 Panhorst, the Bridge Engineer for the state Division of Highways (now Caltrans), designed 32 bridges between 1928 and 1938, from San Simeon to Carmel, as part of the construction of Highway 1, including the 1932 Bixby Creek Bridge at Big Sur (shown). In times of calamity, says Mr. Panhorst, a network of highways offers advantages beyond those possessed by any other carrier. Taking the California floods of 1937-1938 as a case in point, he presents a well-selected list of incidents that demonstrate this thesis. A brief description of the floods provides the background for an appreciation of the examples. This article is an abridgment of a paper presented before the Highway Division at the 1938 Annual Convention in Salt Lake City, Utah. This paper does not discuss the economic or technical factors that may correlate highway construction with periodic floods. 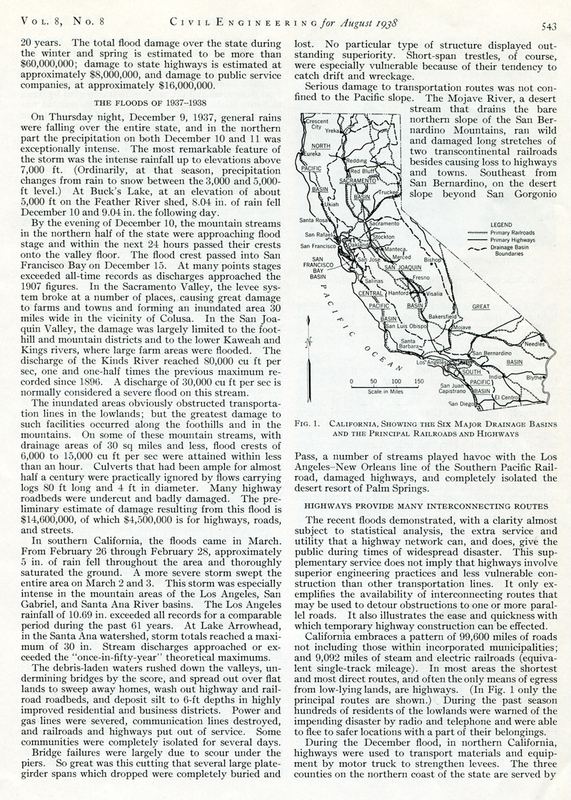 But it does attempt to show, by a few definite examples from recent experience in California, the use of highways in alleviating the distress and loss occasioned by floods — a value not commonly included in highway appraisal. To provide the proper background for these examples, let us first consider briefly the California floods of 1937-1938, and the nature of California floods in general. The streams of California are grouped in six major divisions or basins — the Sacramento basin, San Joaquin basin, San Francisco basin, North Pacific basin, South Pacific basin, and the Great Basin (Fig. 1) [below]. Flood damages are of most significance in the Sacramento and San Joaquin basins, because of their extensive agricultural area, and in the South Pacific basin, which includes the metropolitan area of Los Angeles and the valuable citrus lands of southern California. The San Francisco Bay basin, while embracing a highly developed area, does not include streams sufficiently large to cause extensive flood damage, and in the North Pacific basin the streams, though large, are mainly confined within deep gorges. The Great Basin includes the more arid region along the eastern boundary of the state and does not include many streams of great perennial yield. It is, however, subject to cloudbursts that produce flashy runoffs damaging to highways and railroads. Page 542 | Click to enlarge. Page 543 | Click to enlarge. Page 544 | Click to enlarge. Any description of California floods should differentiate between northern California, as exemplified by the Sacramento and San Joaquin River systems (that is, the "Central Valley"), and the quite dissimilar conditions of the Los Angeles, San Gabriel, and Santa Ana rivers, in the South Pacific basin. The 60,000-sq mile watershed of the great Central Valley forms one of the most complicated river systems of the United States, as it drains thousands of square miles of high mountains where different combinations of elevation, topography, and weather over a wide range of latitude produce innumerable streams of variable temperaments. Except for transportation and communication lines, flood damage is limited largely to the flat areas of the two trunk streams and the short level reaches of the main tributaries from the Sierra Nevada. The maximum floods result from a long period of appreciable precipitation followed by an intense general storm with high temperatures and melting snow on the upper levels. Flood hydrographs in the steep mountain areas parallel the rainfall graphs and have sharp peaks reflecting only the more intense portions of the storms, while on the lower reaches of the Sacramento and San Joaquin rivers, dangerous stages fluctuating less than 5 ft may last almost two weeks. In southern California the situation is entirely different. It requires only the aggravation of a short intense rainfall on the steep and relatively barren slopes to produce runoff rates commonly in excess of 200 cu ft per sec per sq mile, with estimates of 700 cu ft per sec per sq mile on minor areas. The major streams of this area, the San Gabriel and Santa Ana rivers, have flood-yielding sheds of but 220 and 700 sq miles, respectively. Yet within a few hours a normally dry river bed can attain discharges of 40,000 cu ft per sec, at velocities of 10 to 20 ft per sec. At such times tremendous amounts of debris are transported; river channels may change completely during a single flood; and extensive deposit and scour in the space of a few hours may transform valuable citrus lands into a boulder-strewn waste. The seriousness of such floods is apparent when it is remembered that almost half of the state's population is concentrated in the alluvial fans and plains practically at the very edge of the mountains. 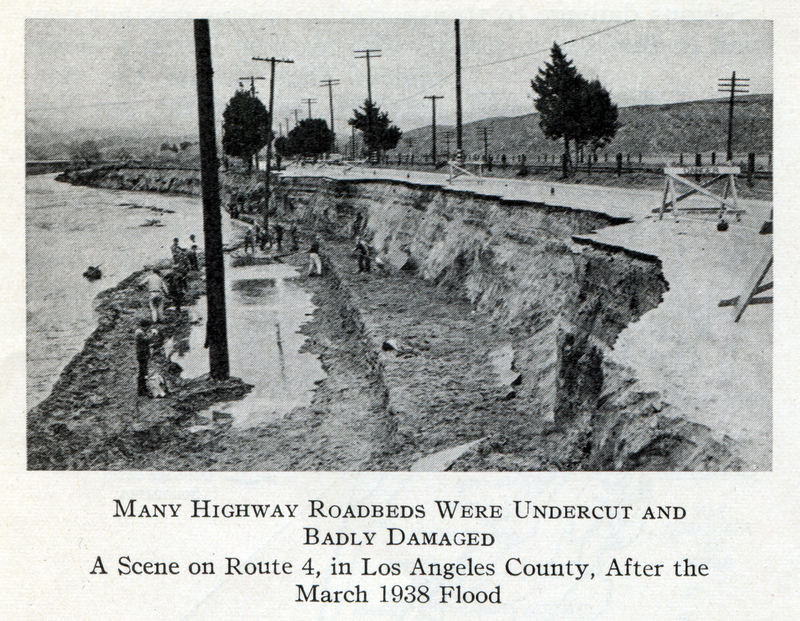 Unregulated flood crests in southern California generally pass within a single day; but the resulting moderately high stages prolong distress by retarding repair work, and by continuing to a lesser degree the scour and deposit started by the higher flows. 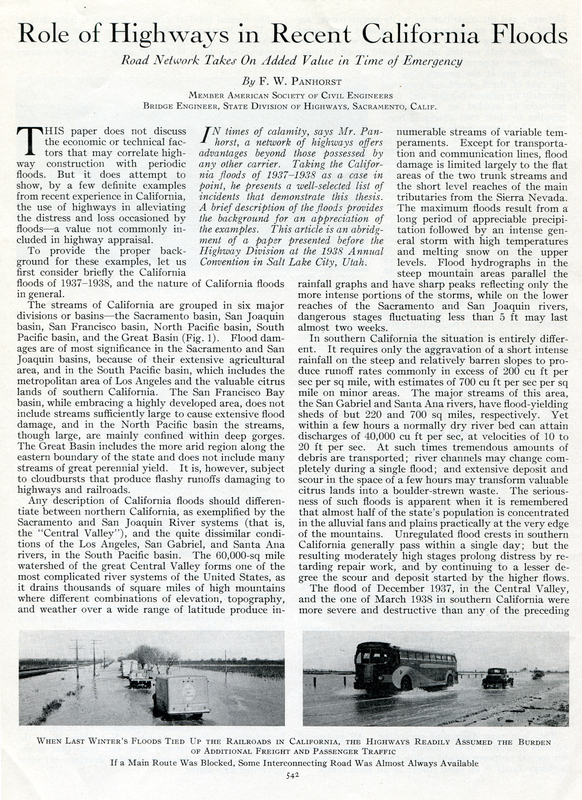 The flood of December 1937, in the Central Valley, and the one of March 1938 in southern California were more severe and destructive than any of the preceding 20 years. The total flood damage over the state during the winter and spring is estimated to be more than $60,000,000; damage to state highways is estimated at approximately $8,000,000, and damage to public service companies, at approximately $16,000,000. On Thursday night, December 9, 1937, general rains were falling over the entire state, and in the northern part the precipitation on both December 10 and 11 was exceptionally intense. The most remarkable feature of the storm was the intense rainfall up to elevations above 7,000 ft. (Ordinarily, at that season, precipitation changes from rain to snow between the 3,000 and 5,000-ft level.) At Buck's Lake, at an elevation of about 5,000 ft on the Feather River shed, 8.04 in. of rain fell December 10 and 9.04 in. the following day. By the evening of December 10, the mountain streams in the northern half of the state were approaching flood stage and within the next 24 hours passed their crests onto the valley floor. The flood crest passed into San Francisco Bay on December 15. At many points stages exceeded all-time records as discharges approached the 1907 figures. In the Sacramento Valley, the levee system broke at a number of places, causing great damage to farms and towns and forming an inundated area 30 miles with in the vicinity of Colusa. In the San Joaquin Valley, the damage was largely limited to the foothill and mountain districts and to the lower Kaweah and Kings rivers, where large farm areas were flooded. The discharge of the Kinds [sic] River reached 80,000 ct ft per sec, one and one-half times the previous maximum recorded since 1896. A discharge of 30,000 cu ft per sec is normally considered a severe flood on this stream. Fig. 1. | Click to enlarge. The inundated areas obviously obstructed transportation lines in the lowlands; but the greatest damage to such facilities occurred along the foothills and in the mountains. On some of these mountain streams, with drainage areas of 30 sq miles and less, flood crests of 6,000 to 15,000 cu ft per sec were attained within less than an hour. Culverts that had been ample for almost half a century were practically ignored by flows carrying logs 80 ft long and 4 ft in diameter. Many highway roadbeds were undercut and badly damaged. The preliminary estimate of damage resulting from this flood is $14,600,000, of which $4,500,000 is for highways, roads, and streets. In southern California, the floods came in March. From February 26 through February 28, approximately 5 in. of rain fell throughout the area and thoroughly saturated the ground. A more severe storm swept the entire area on March 2 and 3. This storm was especially intense in the mountain areas of the Los Angeles, San Gabriel, and Santa Ana River basins. The Los Angeles rainfall of 10.69 in. exceeded all records for a comparable period during the past 61 years. At Lake Arrowhead, in the Santa Ana watershed, storm totals reached a maximum of 30 in. Stream discharges approached or exceeded the "once-in-fifty-year" theoretical maximums. The debris-laden waters rushed down the valleys, undermining bridges by the score, and spread out over flat lands to sweep away homes, wash out highway and railroad roadbeds, and deposit silt to 6-ft depths in highly improved residential and business districts. Power and gas lines were severed, communication lines destroyed, and railroads and highways put out of service. Some communities were completely isolated for several days. Bridge failures were largely due to scour under the piers. So great was this cutting that several large plate-girder spans which dropped were completely buried and lost. No particular type of structure displayed outstanding superiority. Short-span trestles, of course, were especially vulnerable because of their tendency to catch drift and wreckage. Serious damage to transportation routes was not confined to the Pacific slope. The Mojave River, a desert stream that drains the bare north slope of the San Bernardino Mountains, ran wild and damaged long stretches of two transcontinental railroads besides causing loss to highways and towns. Southeast from San Bernardino, on the desert slope beyond San Gorgonio Pass, a number of streams played havoc with the Los Angeles-New Orleans line of the Southern Pacific Railroad, damaged highways, and completely isolated the desert resort of Palm Springs. The recent floods demonstrated, with a clarity almost subject to statistical analysis, the extra service and utility that a highway network can, and does, give the public during times of widespread disaster. This supplementary service does not imply that highways involve superior engineering practices and less vulnerable construction than other transportation lines. It only exemplifies the availability of interconnecting routes that may be used to detour obstructions to one of more parallel roads. It also illustrates the ease and quickness with which temporary highway construction can be effected. California embraces a pattern of 99,600 miles of roads not including those within incorporated municipalities; and 9,092 miles of stream and electric railroads (equivalent single-track mileage). In most areas the shortest and most direct routes, and often the only means of egress from low-lying lands, are highways. (In Fig. 1 only the principal routes are shown.) During the past season hundreds of residents of the lowlands were warned of the impending disaster by radio and telephone and were able to flee to safer locations with a part of their belongings. During the December flood, in northern California, highways were used to transport materials and equipment by motor truck to strengthen levees. The three counties on the northern coast of the state are served by U.S. Highway No. 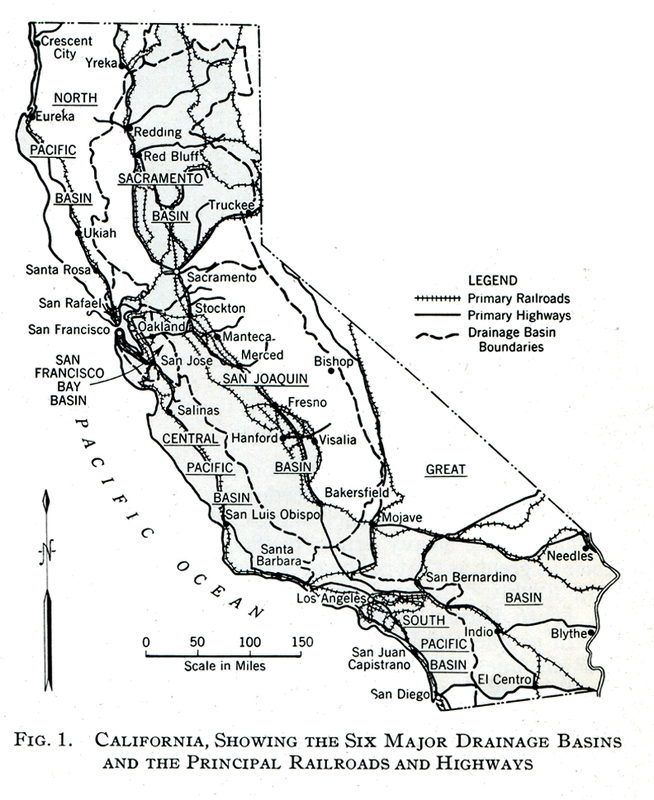 101 and the Northwestern Pacific Railroad, both extending from the San Francisco Bay area. The railroad was closed by slides and slip outs from the middle of December to April, and the highway readily assumed the additional burden as evidenced by light-truck traffic, which exceeded by 50 per cent the peak seasonal count for such vehicles during the previous summer. The heavy truck traffic in April was three times as great as that of the previous July. Route 4 in Los Angeles County, aka the Ridge Route. | Click to enlarge. In thickly populated areas such as southern California, acute distress immediately occurs when transportation of people and foodstuffs is interrupted, when power and gas lines are broken, and when people are made homeless by floods. 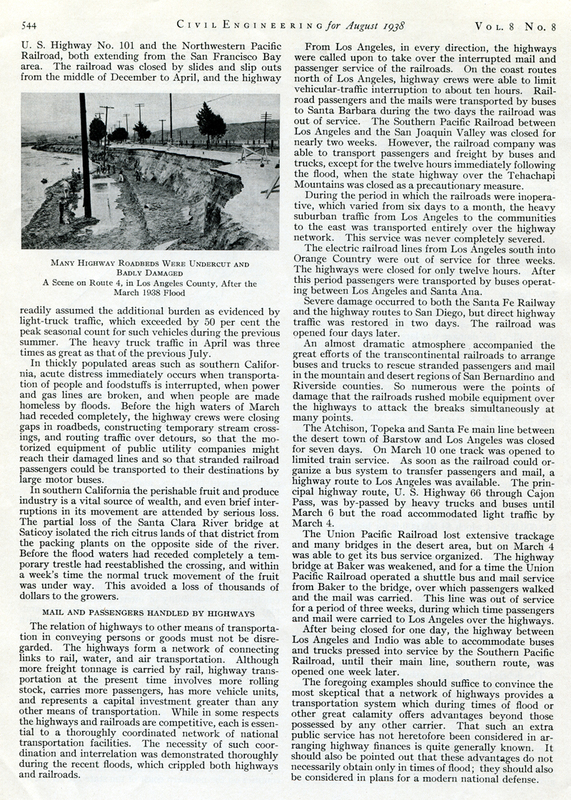 Before the high waters of March had receded completely, the highway crews were closing gaps in roadbeds, constructing temporary stream crossings, and routing traffic over detours, so that the motorized equipment of public utility companies might reach their damaged lines and so that stranded railroad passengers could be transported to their destinations by large motor buses. In southern California the perishable fruit and produce industry is a vital source of wealth, and even brief interruptions in its movement are attended by serious loss. The partial loss of the Santa Clara River bridge at Saticoy isolated the rich citrus lands of that district from the packing plants on the opposite side of the river. Before the flood waters had receded completely a temporary trestle had reestablished the crossing, and within a week's time the normal truck movement of the fruit was under way. This avoided a loss of thousands of dollars to the growers. The relation of highways to other means of transportation in conveying persons or goods must not be disregarded. The highways form a network of connecting links to rail, water, and air transportation. Although more freight tonnage is carried by rail, highway transportation at the present time involves more rolling stock, carries more passengers, has more vehicle units, and represents a capital investment greater than any other means of transportation. While in some respects the highways and railroads are competitive, each is essential to a thoroughly coordinated network of national transportation facilities. The necessity of such coordination and interrelation was demonstrated thoroughly during the recent floods, which crippled both highways and railroads. From Los Angeles, in every direction, the highways were called upon to take over the interrupted mail and passenger service of the railroads. On the coast routes north of Los Angeles, highway crews were able to limit vehicular-traffic interruption to about ten hours. Railroad passengers and the mails were transported by buses to Santa Barbara during the two days the railroad was out of service. The Southern Pacific Railroad between Los Angeles and the San Joaquin Valley was closed for nearly two weeks. However, the railroad company was able to transport passengers and freight by buses and trucks, except for the twelve hours immediately following the flood, when the state highway over the Tehachapi Mountains was closed as a precautionary measure. During the period in which the railroads were inoperative, which varied from six days to a month, the heavy suburban traffic from Los Angeles to the communities to the east was transported entirely over the highway network. This service was never completely severed. The electric railroad lines from Los Angeles south into Orange Country [sic] were out of service for three weeks. The highways were closed for only twelve hours. After this period passengers were transported by buses operating between Los Angeles and Santa Ana. Severe damage occurred to both the Santa Fe Railway and the highway routes to San Diego, but direct highway traffic was restored in two days. The railroad was opened four days later. An almost dramatic atmosphere accompanied the great efforts of the transcontinental railroads to arrange buses and trucks to rescue stranded passengers and mail in the mountain and desert regions of San Bernardino and Riverside counties. So numerous were the points of damage that the railroads rushed mobile equipment over the highways to attack the breaks simultaneously at many points. The Atchison, Topeka and Santa Fe main line between the desert town of Barstow and Los Angeles was closed for seven days. On March 10 one track was opened to limited train service. As soon as the railroad could organize a bus system to transfer passengers and mail, a highway route to Los Angeles was available. The principal highway route, U.S. Highway 66 through Cajon Pass, was by-passed by heavy trucks and buses until March 6 but the road accommodated light traffic by March 4. The Union Pacific Railroad lost extensive trackage and many bridges in the desert area, but on March 4 was able to get its bus service organized. The highway bridge at Baker was weakened, and for a time the Union Pacific Railroad operated a shuttle bus and mail service from Baker to the bridge, over which passengers walked and the mail was carried. This line was out of service for a period of three weeks, during which time passengers and mail were carried to Los Angeles over the highways. After being closed for one day, the highway between Los Angeles and Indio was able to accommodate buses and trucks pressed into service by the Southern Pacific Railroad, until their main line, southern route, was opened one week later. The foregoing examples should suffice to convince the most skeptical that a network of highways provides a transportation system which during times of flood or other great calamity offers advantages beyond those possessed by any other carrier. That such an extra public service has not heretofore been considered in arranging highway finances is quite generally known. It should also be pointed out that these advantages do not necessarily obtain only in times of flood; they should also be considered in plans for a modern national defense.